Early legends about how Satan deceived Adam and Eve a second time – and his contract with Adam. Everyone knows the story of the fall of Adam and Eve. But what happened to them once they were kicked out of the Garden of Eden? Some authors elaborated on how Adam and Eve were overcome with guilt and repented, while others describe Satan’s continued assault. For example, the apocryphal Life of Adam and Eve, which was written around the first century CE gives an expanded version of Genesis 3 and 4. In it, Adam and Eve repent for disobeying God – Adam is to stand in the Jordan for 40 days while Eve shall stand in the Tigris for 37 days. About half way into their repentance, Satan appears to Eve as an angel and deceives her into believing God has forgiven them. She and Satan then go to Adam, who reprimands her for interrupting her penance. They ask why Satan has chosen to attack them so harshly. He replies that God had made man in his own likeness and asked the angels to worship Adam. Satan refused, as did a number of other angels. God became angry and kicked the lot out of heaven. After that, the Adam and Eve go their separate ways until Eve gives birth. 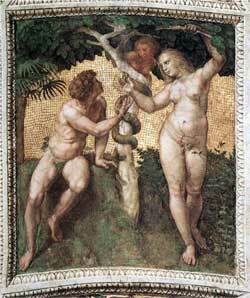 Adam completes his penitence while Eve does not, so the blame is clearly laid upon Eve, not Adam. By the Middle Ages, the tradition had evolved. Now Satan tricks Adam into signing a contract (Greek cheirographos) agreeing to be his servant. There are three main variations of this. In the first version, Adam tills the earth until Satan dupes Adam into believing that he (Satan) owns the earth and that Adam is forbidden to plow without his permission. Adam then signs a contract which makes him Satan’s tenant farmer until the coming of Jesus. In the second version, when Adam and Eve are kicked out of the Garden, it is night. The Garden had always been well lit, so they believe they will have to live in darkness. Satan uses the opportunity to trick Adam into signing a contract in exchange for giving Adam light. Adam realizes he’s been deceived when daylight comes, but Satan hid the contract. Finally, in the third version, Cain is born a monster with twelve snake heads. When Eve breast fed him, the snake heads bit into her stomach and caused her pain. Satan promises to cure Cain and relieve Eve’s pain if Adam will sign a contract. He slaughters a goat and signs the contract with its blood “The living are God’s and the dead are yours.” Satan then removes the snake heads and puts them in the Jordan to guard the contract. Only when Jesus is later baptized in the Jordan does he crush the snakes. However, Satan takes the contract to hell with him. Only after Christ descends into hell does he break the contract.